According to Chef Carla Hall, a former Top Chef contestant “There is man law and there is chef law”. Yes, this was in reference to “food plagiarism”, but I think that Chef Carla is right about being an unspoken “chef law”. I noticed this “law” after my first stage at The Blue Bottle Cafe in Hopewell, NJ. After several weeks of volunteering my time to learn the ropes of a real kitchen, toiling menial prep jobs (though don’t get me wrong this is one of my favorite aspects being in a kitchen, it’s cathartic just chopping vegetables), and working long hours on my feet in hot a kitchen, I was treated to a chef’s tasting/ farewell dinner. As a chef, this is one of the rare occasions that you are the diner. Pawel and I (me out of my whites and in “civilian” clothes) got to dine at the Blue Bottle Cafe but were treated like kings. Chef Arron & Chef Rori provided us with a delicious tasting of their menu that a typical diner does not get. To me this was far better than being paid for the work I had done. Plus, I look at it as I was taught priceless things from them and even this tasting was beyond generous. The culinary world has introduced me to a network of individuals that have helped me, inspired me and continue to teach me new things. The French Culinary Institute alone has put me in line to meet some of the most famous people in the culinary world. In February of this past year I got the opportunity to meet Jacques Pepin for coffee in Playa del Carmen. He is one of the deans of FCI and he was more than happy to meet a former student. In another stage, I worked Saturday family meals at the Hamilton Grill with the owner Jim Hamilton who has offered and still holds those “doors” open, for me to obtain opportunities in well known restaurants of New York City. Knowing these people have also given me the chance to connect my friends and family with the food I love. The beloved Hamilton Grill hosted my wedding reception meal. It felt good to be in good hands and I thank them for contributing to the memories. I have kind of gone off on a tangent, but I wanted to express to you this “law” that connects chefs to one another and truly gives you opportunities that a typical patron would not receive. Even in Cozumel I was given this opportunity again because I am a chef. 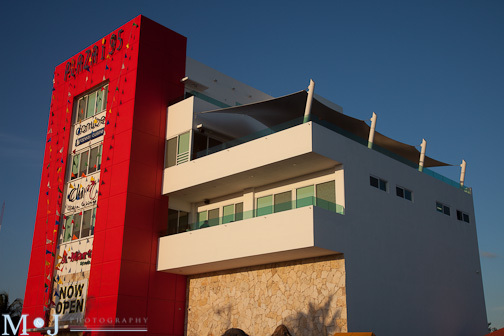 Danube, the “new guy” in town, recently opened in the new i95 Plaza building across from the International Cruise Ship Pier in Cozumel. This restaurant offers an eclectic European influenced menu all at the hands of Chef Jonathan Schwartz, a CIA graduate who spent some time working for Bouley. I heard about this new chef in town and was curious about the food. Pawel and I decided to eat lunch one afternoon there and I took this opportunity to introduce myself to the chef. Following our lunch, Jonathan reached out to me and asked if I would be willing to come in for dinner and provide feedback on his new dinner menu he was planning to launch. Honored, and I can never say no to food, came into Danube for an evening tasting. The fullness and richness of his food I became full quite quickly, but the highlights still linger on my tongue. Everything is made from scratch, from compound garlic butter to the fresh rolls. 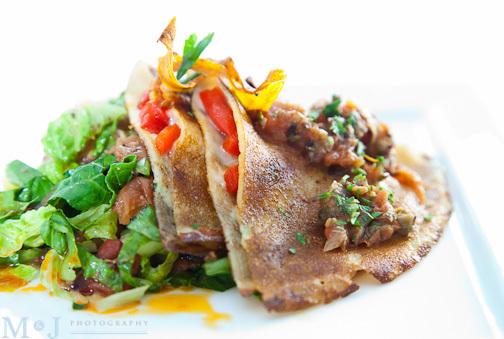 We started our meal with a savory crêpe served with roasted peppers and swiss cheese. This dish was followed by a seafood clam chowder with bacon and potato. Even after these two plates, I knew quite well that a professional chef was behind these dishes. The fresh grilled pear salad with blue cheese was a wonderful combination of flavors. The shrimp and scallop ravioli served with fried carrot sticks was inventive. My favorite dish and slightly reminiscent of Pawel’s grandmothers Polish/ old-world cooking was the fried pork schnitzel that had braised cabbage and a bold meaty mushroom sauce. I wanted to lick my plate. We ended our meal with the classic and whimsical. First, the chocolate coffee pot de crème…you can’t go wrong, but my favorite…Nutella and marshmallow crêpes . It seriously was like a grownup s’mores. I thanked the chef, told him I took good notes and that I would be happy to meet with him to discuss the meal. You can’t get this kind of treatment unless you are a critic or somehow know the owner. In all honesty….”it’s good to be chef”. **Note: this was written after the departure of Chef Jonathan. He has since moved on to other things and has left Danube in the trusted hands of Chef Sang Yoon Kim, another CIA grad. I still highly recommend Danube and I hope that more restaurants like this come to Cozumel. To Chef Jonathan…I thank you for the meal and I wish you all the best in your endeavors! Hours of Operation: Monday to Thursday 10 AM to 4 PM, Friday & Saturday 10 AM to 11 PM. For photos and more information check out Danube’s website or my friend’s (Michael & Jennifer) blog; Nuestra vida deliciosa – Our delicious life. The photo’s for this blog post were contributed by M & J Photography.